I’m sad to say that our time in the Middle East is almost over. We’ve enjoyed lots of fresh hummus, dates and coffee over the past few days, and it’s been so much fun cheering on Ismaili athletes alongside fans and friends. While I’m looking forward to getting back to a normal routine and my own bed (the absences of which can throw us off whack during a long vacation), this has been the most eye-opening and adventurous trip I’ve ever accompanied my parents on! You know how the days seem to blend together when you’re busy exploring a new place? That’s how the last two weeks have been. 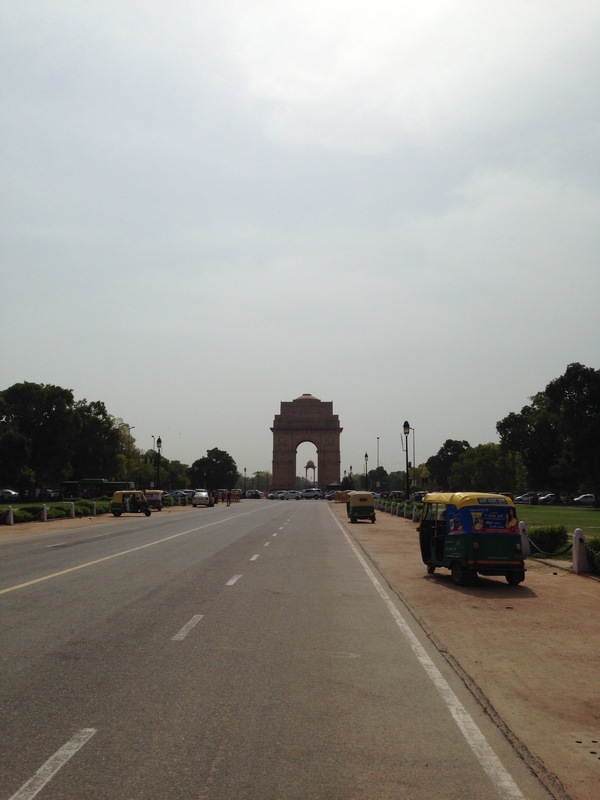 We hit the ground running in India, visiting three cities in six days. We took long, informative tours of important cultural monuments and areas such as Jama Masjid, the Red Fort, Lotus Temple, Fatehpur Sikri, and the Taj Mahal. I’ve probably just been having too much fun! The good news is that it’s not over yet – the Burj Khalifa and Dubai Mall are on tomorrow’s schedule for our last day in Dubai. Yesterday, we attended the Closing Ceremonies for the 2016 Jubilee Games. 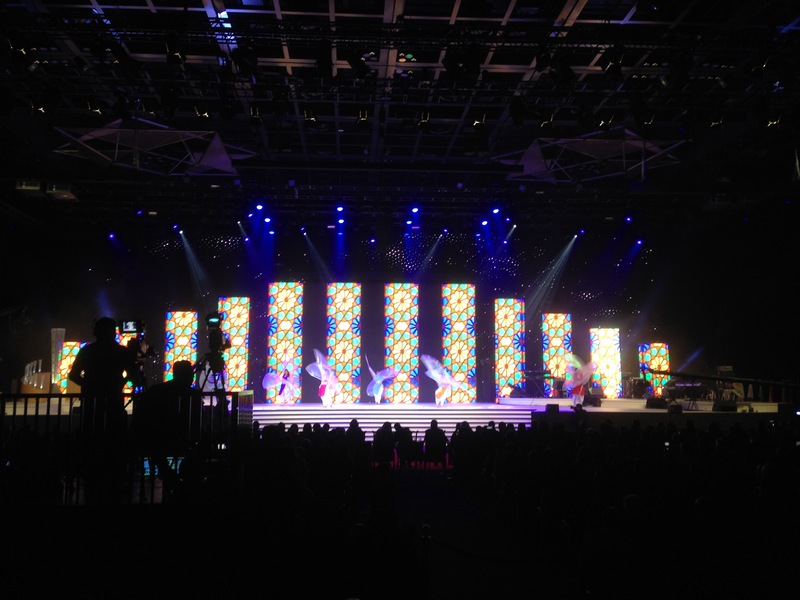 It was held at Dubai World Trade Centre and featured a ton of awesome performances. From incredible Tajikistani dancers to a surprise concert from famed musical duo Salim-Sulaiman, there wasn’t a dull moment to be found. The best part was when each and every Ismaili athlete walked in a parade around the hall, some dancing to the music with their teammates, others proudly carrying their home flags. After months and years of dedication and hard work, it was their moment and they deserved to celebrate! The Tajik dance troupe stole the show with stunning choreography and visuals! Today was a great day, mostly because I slept past 7 AM for the first time since we left Toronto, but also because I got to witness Canadian soccer teams taking home gold medals! As I mentioned yesterday, we’re here in Dubai for the Jubilee Games, a global sports competition organized by our Ismaili Muslim community. For me, soccer has been the most thrilling game to watch – I shouted and screamed so often during today’s games that my throat feels like it’s been burned. During the day, I took it easy and just relaxed at the hotel. 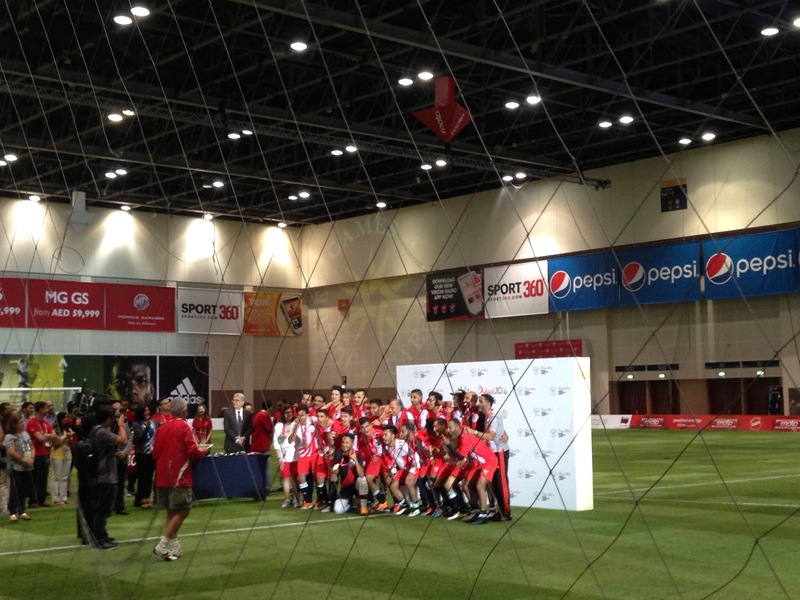 I had some time to kill because the men’s soccer final was taking place at 9 PM inside Dubai World Trade Centre (DWTC). 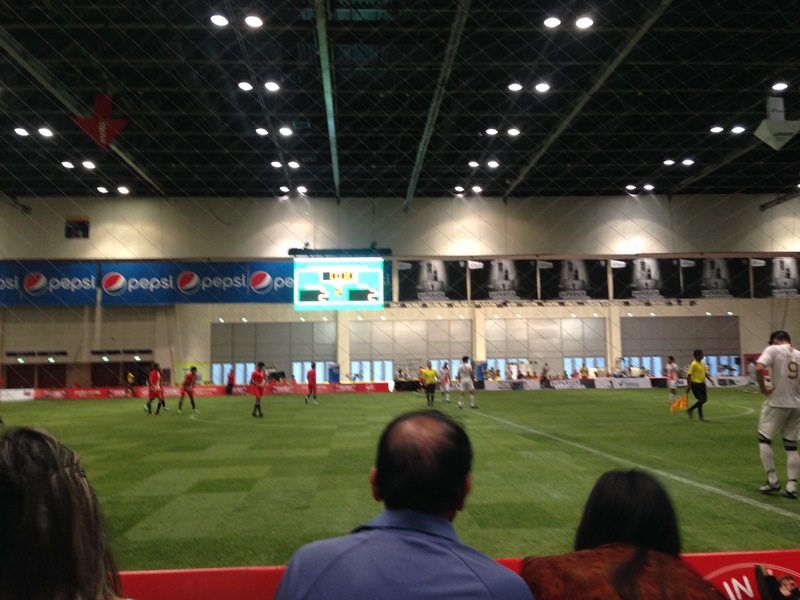 It was Canada VS Tajikistan – we knew it was going to be a very close match because both teams were equally strong and, I think, equally motivated to get the win. Tajikistan started off strong with a 1-0 lead for the first half, but in the end, the Canadians nabbed the gold medal with a 2-1 victory! The Canadian men’s team celebrating their win! My mum and I also caught the second half of the Canadian women’s soccer final, where our team won 3-1. The U.K. won bronze and Pakistan won silver; on the men’s side, Tajikistan was awarded silver and Pakistan got the bronze. Right after the awards ceremony, my parents and I and some of my mum’s Council colleagues decided to check out the cricket game final (Canada VS Pakistan), which started at 11 PM at an outdoor field thirty minutes away. 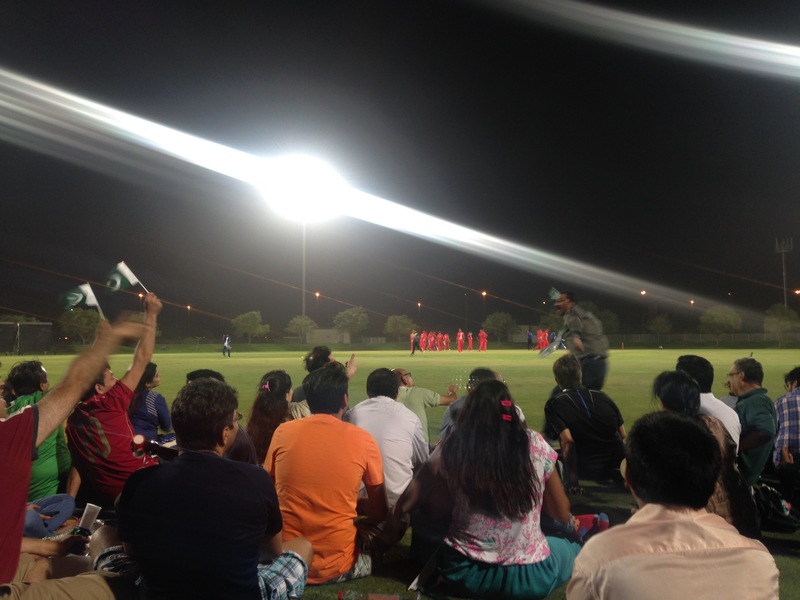 There was a coach leaving DWTC at midnight, and when we arrived, it was clear Pakistan was winning. The crowd’s loud cheers in Urdu and the hundreds of Pakistani flags made me feel a little out of place, but it was great to see so many united Ismailis supporting their home team. They also made a point of tossing out some, “Go, Canada!” cheers, which we appreciated given that the score was heavily in Pakistan’s favour. We left before the end and got back to the hotel at 3 AM. I’m heading to bed now – can’t wait for the Jubilee Games Closing Ceremonies tomorrow! Welcome back to my travels, everyone! Thanks for sticking with me this far. Today’s post will be a short one as it’s 1:34 AM here in Dubai and sleep beckons. Today was the perfect first day in Dubai. Technically we started our week-long trip yesterday after flying in from Jaipur, but we were so tired that we couldn’t do much more than check out the hotel, grab dinner and go to bed. Today, we were able to have breakfast amongst family and friends from Toronto, watch an awesome soccer game, attend jamatkhana at the beautiful local mosque and go out for dinner with some friends. After screaming ourselves hoarse after the win, we got ready for jamatkhana (mosque) and headed there in a cab. (So far, Dubai seems like a very sleek and developed city – its streets are lined with fancy stores and flashy skyscrapers.) The Ismaili Centre Dubai, where jamatkhana is, is a beautiful space that my parents and I will hopefully take a tour of tomorrow. We met several Toronto friends there and decided we would all go out for dinner afterwards. 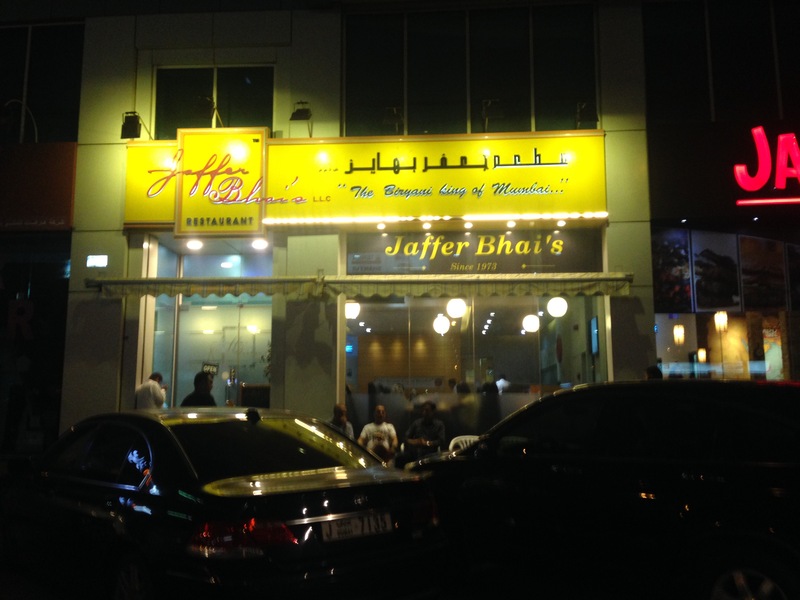 One of our friends suggested we go to an Indian restaurant called Jaffer Bhai, and I’m so glad we listened to him – everything was great, from tandoori chicken and vegetables to mutton biryani and butter chicken. There were 11 of us, and even though we ordered about seven or eight dishes, we couldn’t finish it all. Jaffer Bhai’s may not look like much, but its food is delicious! That’s it for today. I’m off to bed – goodnight! Whew! Today was another full day of fun in India. Monday was our only day in Jaipur and we wanted to explore as much of the colourful city as possible. 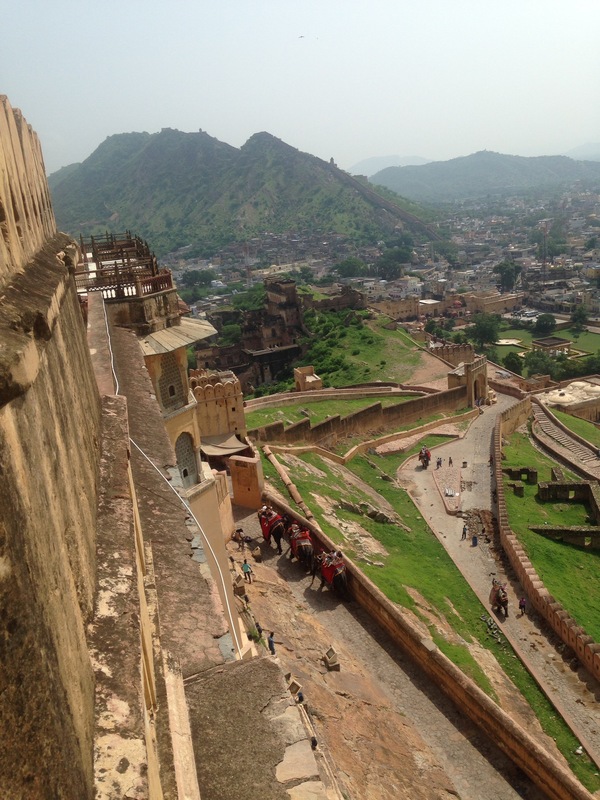 We started off with a tour of Amber Fort, an ancient maharaja palace built on a mountain. 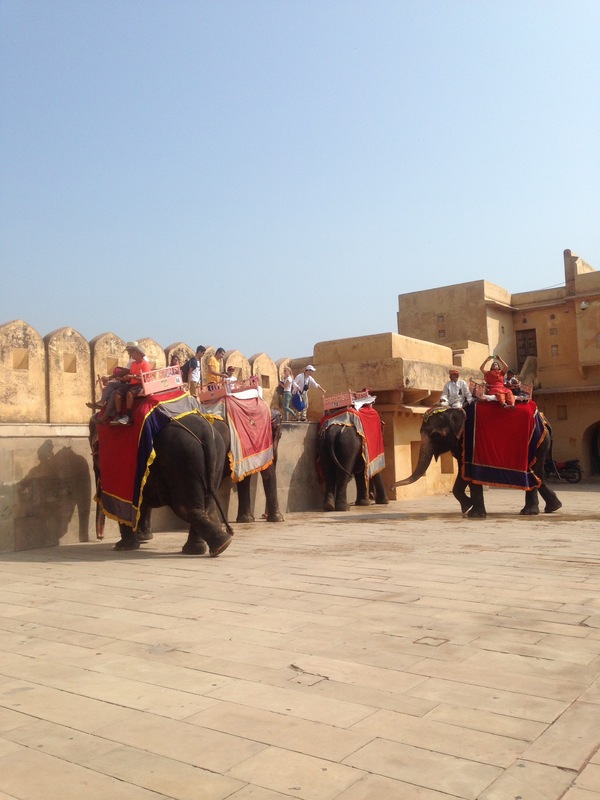 There was an option to reach it by riding on elephant back…and we took it! Can you spot the elephants? We were way up there. What a ride! Welcome back, everyone! As you may know from my previous post, today was a big day: my parents and I visited the glorious Taj Mahal! We started our day at 5:20 AM because we wanted to beat the crowds and the heat. 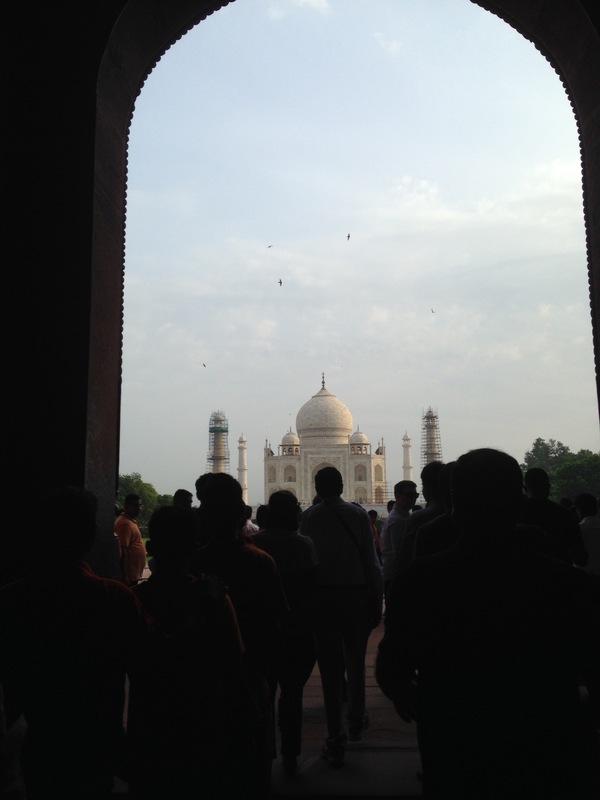 At 6:30, we met our new guide, Masood, who told us which items would be prohibited inside the Taj. Our driver, Rajesh, dropped us at the street entrance of the site around 6:45 AM and we could already feel the humidity. 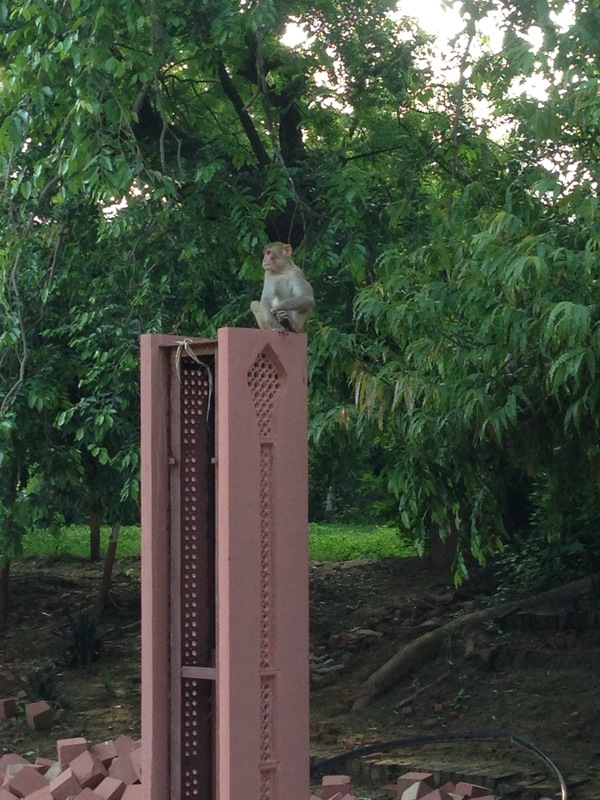 Families of grey monkeys hung out on pink pillars lining the dirt roads we walked up, their babies chasing each other and eating bananas. Everyone stopped in their tracks to look! 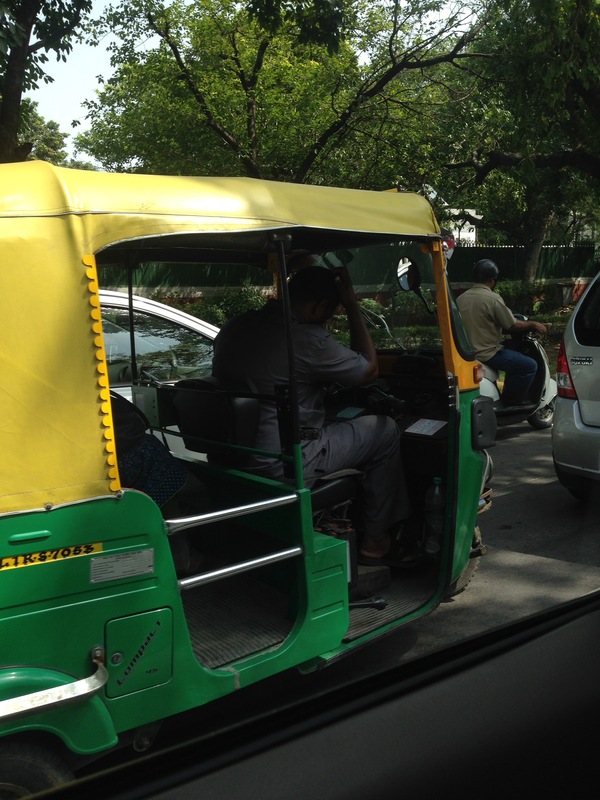 I already miss Delhi’s thrilling and chaotic streets, rickshaws speeding alongside us! Note the lush greenery lining the road. This morning, I woke up feeling really disappointed that we were leaving Delhi. It had been an awesome couple of days exploring the city (check out my recap of our final day in Delhi here) and I hadn’t expected to like it so much. 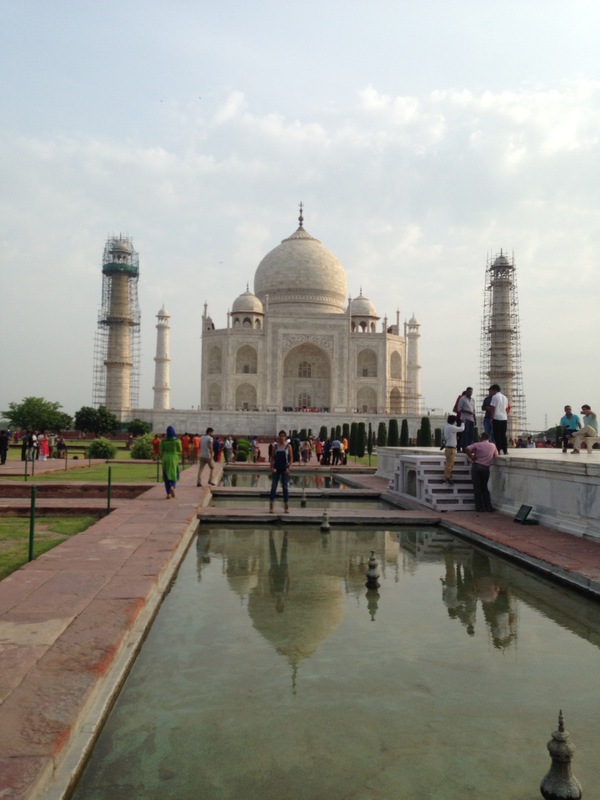 However, on today’s schedule was the drive to Agra, which put us one step closer to visiting the Taj Mahal. I didn’t need much convincing to pack up and leave! Our time with Vikas, our tour guide in Delhi, was over, but thankfully we still had the same driver. Obviously we don’t know Rajesh well, but it’s been comforting to encounter the same person each time we get into the car; exploring a developing country is clearly much simpler when one has a reliable guide and driver and doesn’t have to worry about personal safety and taxi fares. After breakfast and a hassle-free check-out from the Shangri-La’s Eros Hotel in Delhi, Rajesh picked us up and we headed for Agra. I loved seeing Delhi streets on a weekday morning, where passengers in automated rickshaws furiously typed or talked on their iPhones and children in uniforms made their way to school. We passed the Supreme Court of India, where busy-looking men and women rushed down the street in black barrister gowns, arms loaded with papers and books. We shouldn’t have been so surprised to see an equal number of female barristers, but I think something like that is a rare sight in developing countries. Later, we took a bridge over Yamuna River, which had a lot of garbage floating in its murky water but looked like it was once beautiful. 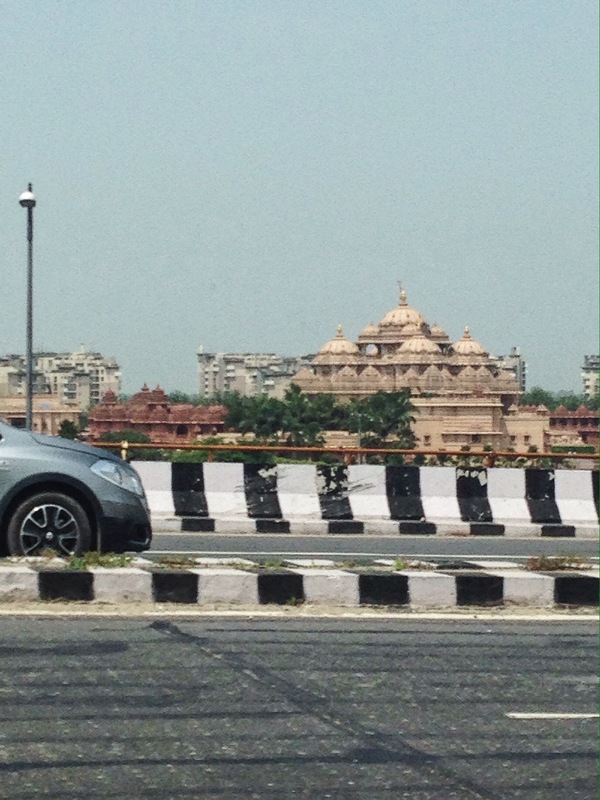 From a distance, we saw the majestic Swaminarayan Akshardham, one of the largest Hindu temples today (see below), as well as the stunning Lotus Temple. The third-largest Hindu temple in the world! What a splendid site. We also noticed miles and miles of rice paddies surrounded by straw huts, neither of which I had seen before. About two hours into the drive, we came upon a roadblock where a large electrical wire had fallen onto the highway. It took workers about fifteen minutes to move it off the road safely, and while Rajesh used the time to stretch his legs, many of the other drivers stayed in their cars to continuously honk their horns. Definitely expect constant and aggressive honking if you’re ever in India! 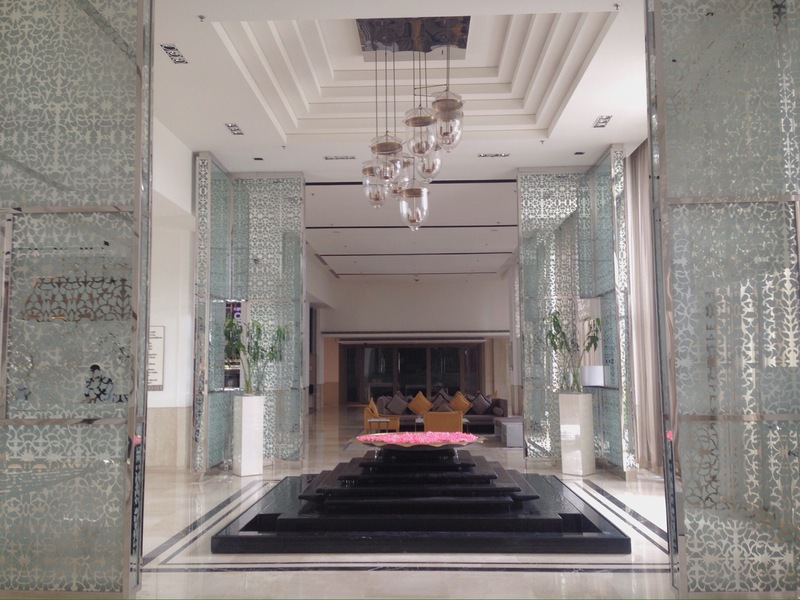 Beautiful lobby with intricate wall hangings and designs. It felt wrong walking into such splendour after driving through what felt like slums, a feeling I’m sure many foreigners experience when they stay in Agra. We realized after seeing the city that there isn’t much shopping or eating to be done outside of the hotels, but tomorrow (Saturday) we’ll visit the Taj Mahal at 6:30 AM followed by certain historical sites nearby. Stay tuned for an account of our day! I can’t believe it’s our third day in India already. We leave Delhi first thing Friday morning for a weekend in Agra. I’ll miss this loud, chaotic city! If you’ve read my post from yesterday (find it here), you’ll understand why I was a little nervous about what our tour guide, Vikas, had planned for us today. Luckily, there were no elephant rides or riding backwards on motorcycles (which I imagine would be as thrilling yet uncomfortable as yesterday’s rickshaw adventure)! On today’s itinerary was a historical tour of New Delhi, concluding with free time at a large mall nearby. Our first stop was a photo op at India Gate, a 1931 war memorial for Indian soldiers who lost their lives during World War I. The arched gate and long stretch of road in front of it took me back to Paris for a few minutes – it’s strikingly similar to the l’Arc de Triomphe and, in some ways, the Champs-Élysées. Vikas gave us some history about the city’s politics and army, then we made a quick U-turn and parked on the same street in front of Rashtrapati Bhavan, or Presidential Residence. It’s a palatial estate where – you guessed it – the President of India resides. The country has a President and a Prime Minister, but apparently the Pres. has a lot more power and influence.